Omar, the new Palestinian thriller written and directed by Hany Abu-Assad (who also directed and co-wrote Paradise Now), is about Omar (natch), a Palestinian involved in a group fighting against the occupation and who soon finds himself caught between Hasan and a hard place (the hard place being the Mossad, or Israeli secret police). Omar is young, in love and helps kill people. A baker by day, a terrorist (well, freedom fighter depending on what side of the conflict you come down on, I suppose) by night, he goes on a mission with Tarek, the brother of the woman he loves and wants to marry. But since he stole the car they used, the actual shooting of an Israeli shoulder is left to Omar’s friend from childhood Amjad. But someone talks and Omar ends up arrested, imprisoned, and tortured in order to find out who pulled the trigger (and let’s say that having great balls of fire has a different meaning here). When he strikes a deal to do the Massad’s bidding and bring in Tarek, he is let go. But Omar tries to double cross the Massad and find out who the pigeon is. It’s a nice little set up for a thriller and there are some thrilling moments, especially toward the end as things go, shall we say, just a bit on the awry side and people turn out to not be exactly who one thought they were and double crosses become deceptions of the deepest kind as the terrorists use their cause at times to further their own personal agendas. 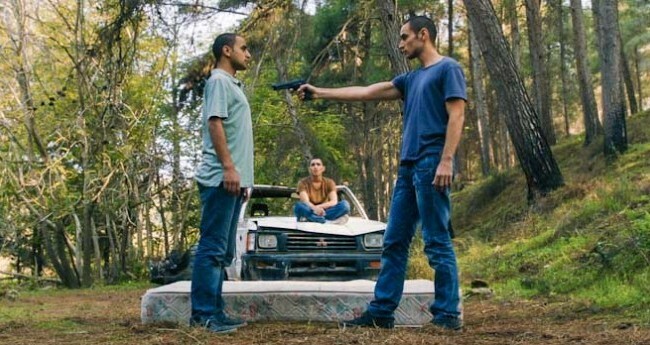 But this is where the movie also goes a little wrong, I think, as the movie seems to have two through lines fighting for attention: the political polemic of the Israeli treatment of Palestinians and a more personal story of betrayal by those Omar had strong emotional connections to. And Abu-Assad never quite brought these two through lines together in a satisfactory whole as far as I was concerned. In many ways, the basic plot feels like something out of those classic film noirs of the 1950’s in which the central character is cruelly betrayed by someone he had a deep emotional bond with (The Killers, I Walk Alone, Criss Cross—Burt Lancaster made an early career out of them). But it’s an exploration of these bonds that is missing in Omar. He may be friends from childhood with Amjad, but you would never know it if someone hadn’t mentioned it once in an extremely flitting moment of passing during the film. The two never remotely act like BFFs and if you have to tell an audience something this important rather than dramatize it, it’s probably not going to have the ultimate effect one might want. And the love story, Omar’s desire to marry Tarek’s sister Nadia, never catches fire. There’s no real passion, just a sweet, naïve innocence. But that’s probably not the real issue, though. The problem may be that Nadia never becomes a real person, but is more just a pawn in the writer’s dramatic game, as she does some things that are never really explained in as satisfactory manner as they perhaps should have been. And without these two strong emotional relationships driving the story, when the betrayals come, they just don’t have the impact that is needed to really raise the move above what it is and, as a result, it never really becomes much more than the political polemic. The actors get the job done, though in that area, the film is probably stolen by Waleed Zuaiter as Omar’s Israeli handler, who, like Liam Neeson in The Lego Movie, plays both good cop/bad cop. And it does have a great ending with, as I said, some thrilling moments as well as some clever and unexpected plot turns before you get there. I’ll doubt you’ll be disappointed. With Adam Bakri as Omar, Samer Bisharat as Amjad, Iyad Hoorani, and Leem Lubany as Nadia. Nominated for Best Foreign Language film at the Academy Awards.